ECG related standards such as IEC 60601-2-47 and IEC 60601-2-51 require "multi-channel" tests where unique signals are applied to each lead electrode. 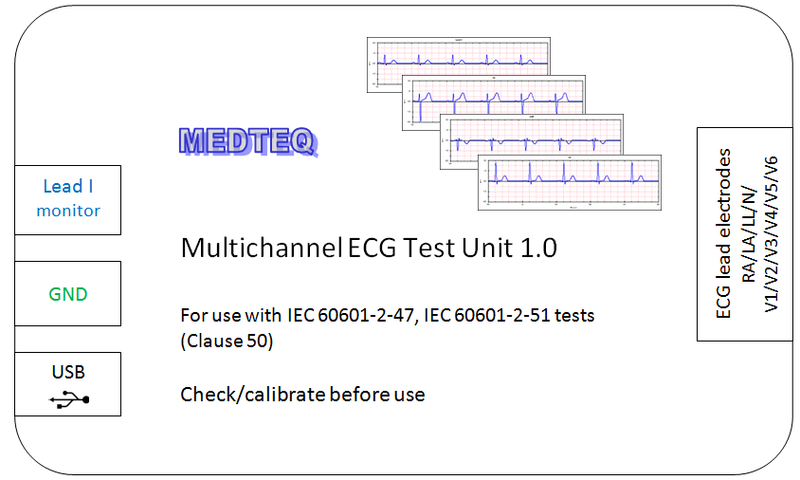 MEDTEQ's Multi-Channel ECG test system comprises of a USB Module incorporating microprocessor control, 8 channels of precision electronics and an output network made of 0.1% resistors to ensure high accuracy. 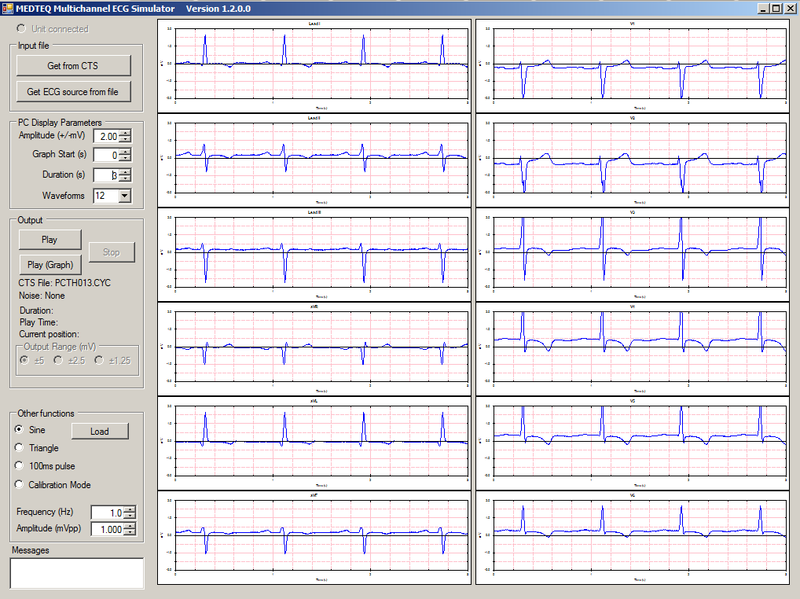 Using the network described in IEC 60601-2-51 Annex II, these 8 channels of DAC data are convertered to the full 12 lead ECG waveforms (Lead III, aVR, aVL, aVF being derived from Lead I and II). Data is continuously streamed to the test unit via USB, and the PC software includes a graphical display lets the user see the waveforms being applied during the test and compare to the results in the equipment under test. The waveforms from IEC 60601-2-51 Annex HH (13 CAL, 3 ANE, 100 biological ECG) are embedded in software (including noise waveforms). A module has also been included to download and play waveforms from various databases available from Physionet website. The module has been designed to work with most Format 16 and Format 212 files, and users without any experience with the Physione website can still download waveforms directly). Selected "single channel" periodic test waveforms such as sine and triangle waves can also be output. Note: A 12 lead ECG only contains 8 unique waveforms. Lead III can be derived from Lead I and Lead II, while aVR, aVL and aVF can be derived from Leads I, Lead II and Lead III. Thus, a 12 lead ECG can be established from an 8 channel DAC system.